Where to start? I can only say that as I flipped through the pages of this truly journalistic endeavor last January, I found (as many will and have) that place in my bones that thirsts for this freedom. 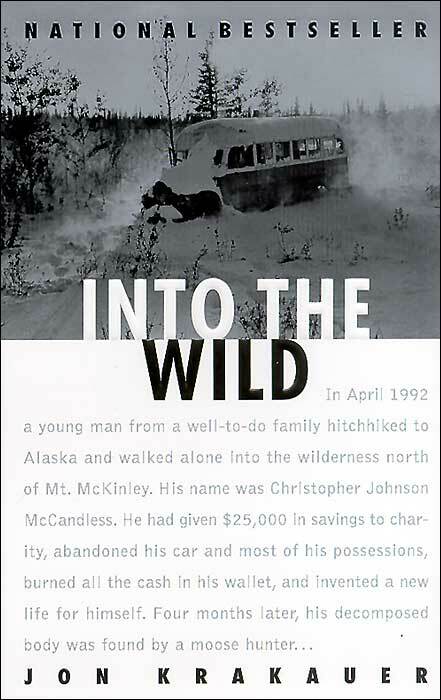 This book, Into the Wild, was written about a young man, Chris McCandless. This young man grew up in a middle-class neighborhood in Virginia with parents whose lives succumbed to the ‘dream’ which kept them working into the morning when they would wake to start again. This young man seemed to develop at a young age a distaste for the unnecessary and a hunger for the most raw qualities of life. Only at his parents insistence did he consent to go to college, where he continued his pursuit of life in its mystical, raw form. But, after college he decided to adventure. An adventure (as I have gathered) about which many fantasize and few find. It seems like Chris’ purpose was more in getting lost in adventure than finding anything at all. I got caught up in the intrigue, the shock of decisions that thrust a fist at culture – at norms and white picket fences. Intrigued… but sadly stirred by each desperate page of Chris’ story. You see, at the end of it all, Chris McCandless found death in his adventure’s end in Alaska. The brilliant works of Tolstoy and Thoreau his only companions, this young man disappeared from this world. Don’t we all wish we could ask him now, “Was it worth your life to go into the wild?” … but I would want to know, “Was it worth souls?” Granted, I have no idea the condition of Chris’ heart when he died. But, I would still want to know if he felt like his life happened for a reason beyond his desire to live it. When we decide to give up everything for adventure – to live in the rawest form of life we can find – we are still no closer to true life. Unless… well, unless you purpose yourself into the wild for the sake of something greater than yourself. For the sake of the Gospel, perhaps? This entry was posted in Old and New Literature, Thoughts.